Interested to hear if anyone goes out their way to strengthen their printers heated bed soldered joints? One of the thermistor wires came away from my tronxy x3a bed mid-print last night. Not surprising seeing as the wire is so thin and weak. Proves the tronxy has thermal safety measures in place as the heated bed sure off. I was going to solder it back when I get a moment, but I also thought I might create a bracket to attach to the print bed carriage that holds the wires in place and frees the joints from the stresses of movement. Any other solutions out there? General Discussion / What did the Postman bring today? What 3D Printing stuff did you pick up or have delivered today? Thought I'd start this thread as the subject's usually popular on forums. I'll start. 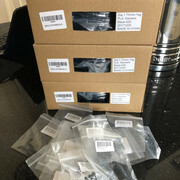 Parcelforce turned up with some Black 1.75mm PLA filament and a handful of various sized machine screws. Been waiting for HK to get their Black PLA in stock for months and been checking stock almost daily, so it was great to see it back in on Wednesday. I immediately ordered 3 rolls of the stuff, which is handy as within a few hours they were out of stock again! General Discussion / Seriously excited! I got up early this morning to test print a little bracket to double check the size before ordering some acrylic that would fit inside it. The Malyan M150's print nozzle was sat a couple mm's off the glass surface so I needed to lift it. I was tired, and stupidly adjusted the Z height the wrong way and the nozzle was forced down into the bed. I immediately realised my mistake and wound the control knob the correct way and the nozzle lifted. Unfortunately the home position has now changed, and it's so low I can't fit the glass on the bed as the springs are already at max compression. It all happened so fast (plus I was super tired, so slower than usual) that I don't know exactly what happened. The Z stop should have activated (not that I noticed it) but, because glass was on the bed and the new carriage is so thick (8mm), the heated bed was still forced down by the nozzle a good 3-4mm before hitting the carriage - and then the motor then made that awful grinding noise for a couple of seconds. I'm trying to figure out how the home position has physically changed? Something physical must have moved to create the change I guess? As I didn't build the Malyan (it came boxed in 2 pieces that you just bolted together) I've not yet seen inside the enclosed X axis area that's responsible for the rise and fall of the rods. The Malyan is fitted with nice chunky lead screws and I guess there's a collet that allows the axis to lift and fall? Could this have skipped a thread? Not my finest moment, and I was in the middle of a mammoth print run, so the timings not the best. Any ideas what's cause the change in home height? Really hoping this is a fairly easy fix. I just upgraded the extruder on my Malyan M150 with an all metal part. The kit from Banggood's made up of an alloy body, alloy sprung arm and a new metal toothed gear. I had to enlarge and partially reshape the lower hole that the filament feeds through as it was in the wrong position for the Malyan M150, but the job was a good'un and the filament now feeds perfectly all the way to the nozzle - straight and true. I took the opportunity to replace the original Malyan nozzle as well. With it all back together and after levelling the printed bed I tried printing one of the original test files (a mouse) that came with the Malyan M150. It's obviously been designed to be easy to print (simple shape, lots of filament being put down, slow print speed etc.) and has always printed flawlessly. But now it won't print past the second or third layer. The first layer printed perfectly with great bed adhesion and a flawless looking finish, but when it gets to the second or third layer the filament suddenly stops being extruded. I tried extruding some PLA by telling the printer to push 10mm through, but nothing came out the nozzle and the teethed gear just ground against the filament. Here's a photo of the new and original nozzle. It may be my imagination, but the original Malyan M150 nozzle hole seems slightly larger then the new 0.4mm one. 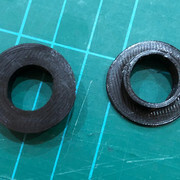 Malyan says the nozzle for the M150 is 0.4mm though, and thats the diameter setting I've been printing with for many months without any issues. I took the extruder assembly apart, replaced the nozzle with a second brand new one and a new piece of PTFE/Teflon tube, I checked for any blockages etc and it all looked perfect. But when I put it all back together the same problem occurred.